Bruce Bradley is Emeritus Professor and has extensive experience with Stone Age technologies and experimental archaeology. He was trained in 4-field anthropology at the University of Arizona. His early research was focused on the North American Southwest and Great Plains where he applied an anthropological approach to much of his work. Since then his research has included the Upper Palaeolithic of Russia and France, and horse domestication in Central Asia. His current areas of research deal with the early peopling of the Americas and prehistoric Pueblo archaeology of the American Southwest . This research was brought to the classroom in many of the modules he taught. Bruce is also active in bringing his archaeological and anthropological interests to the public through presentations, teaching, interaction with Native American communities and participation in documentaries. He has now retired but maintains affiliation with the University and Department, will continue his reasearch and channel his teaching efforts into internationl short courses and workshops. Bruce's research has taken him to projects ranging from Stone Age digs in England, Ireland, Spain, France, Lebanon, Kazakhstan, and Russia. He has also been involved with research at Paleoindian sites in North America, including Clovis, in Wyoming , Colorado and Texas; and he has conducted some of the research in the northern Southwest of the US that is redefining ancient Pueblo history. Bruce is also known throughout the world as a master flintknapper. His current research focus is on the possible Ice Age colonization of Eastern North America. He has recently been appointed Co-principal Investigator of the Gault site in Central Texas. While committed to evidence-based research, Bruce applies his anthropological training to his interpretations. He holds Research Associate appointments at the Smithsonian Institution, the University of Texas and the Carnegie Museum of Natural History in Pittsburgh. Highly respected in the professional archaeology community, he is also active in the amateur community and involves amateurs in excavations where ever he is working. Since coming to Exeter he has also involved many students in his research and excavations in Russia, Ireland, France, the U.K. and Texas. Bruce has been featured in numerous documentaries and is frequently sought out by authors and filmmakers for technical advice. His current projects include contributions to a NOVA programme (American Public Broadcasting Service) that will be aired on November 16, 2010 (in North America). This document an experiment into a revolutionary method of moving large monuments stones in the British Neolithic. He is also contributing to a documentary for the Smithsonian Channel, examining the evidence for a trans-Atlantic connection during the Last Glacial Maxium, scheduled for next year. 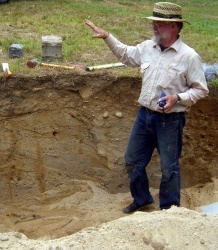 Bruce has received research support from the International Research Exchanges, National Science Foundation of America, and National Geographic, and worked for such prominent institutions as the Smithsonian, the University of Wyoming, Crow Canyon Archaeological Center, Institute of Material Culture History, St. Petersburg, and the Archaeological Institute, Russian Academy of Sciences, Moscow. Bruce is currently working on a book, with Dr. Dennis Stanford of the Smithsonian, about Ice Age colonization of eastern North America leading to the Clovis Culture. This indicates that some early people in the Americas had historical connections to the Solutrean Culture of Southwest Europe. Bruce has also been awarded a three-year Leverhulme Trust grant to support research into the learning of flintknapping and its relationship to the development of the modern human mind in a project called Learning to be Human. This work is in collaboration with Dr. Dietrich Stout, Emory University, Atlanta and Dr. James Steele, UCL, London. Bruce holds appointments in several positions in institutions in North America including the Smithsonian Institution and Augustana College. He has also been appointed Adjunct Faculty in the National Institute of Advanced Studies in Bangalore, India and is actively collaborating with colleaguesat the University of São Paulo and the Federal University of Rio de Janiero, Brazil. I supervised research students on many topics ranging from experimental knapping (Nada Khreisheh), ground and polished stone technology (Andrew Young), pottery technology (Carlos Ceballos and Caroline Jeffra), bone fracturing, the Anthropology of Experimental Archaeology, small animal bones in archaeological assemblages, Clovis flake characteristics, Upper Palaeolithic blade technologies, pre-Clovis site prediction, the transition from atlatl to bow technologies in North America, paleoIndian occupation in Zacatecas Mexico, Upper Palaeolithic assemblages in northern India, Central Texas Archaic technology, and the application of experimental archaeology . I also supervised topics such as 'primitive' technologies, experimental archaeology and Southwest US formative cultures. I am retired and will not be taking on new students as an official supervisor. I have had a varied and extensive experience in fieldwork in many areas of the world. I began my work in the American Southwest with formative society sites but quickly expanded into Palaeoindian sites in the American High Plains and Rocky Mountains. I have continued this work intermittantly though four decades with 12 field seasons of excavation at the Crow Canyon Archaeological Center in Colorado. Along with this I had the opportunity to participate in Palaeolithic excavation projects in France, Lebanon, Spain, England and Russia. In the past several years I have focussed on Paleoindian investigations in Central Texas (the Gault Project of which I was Co-director), director of a project in Maine and collaborator in investigations of remains on the Eastern Seaboard and the submerged continental shelf, USA. I am also collaborating on Paleoindian research, including excavations, in São Paulo State. I have taken University students and amateur archaeologists on many of these projects. I will continue excavtion projects and involved students and amateur archeologists. Over the years I have actively engaged with the academic community through peer reviews of publications (Journal of Archaeological Science, Antiquity, American Antiquity, etc) and grant proposals (National Science Foundation, USA, National Geographic, etc. ), member or examiner on PhD boards outside the University of Exeter including for Lund University, Sweden, Southern Methodist University, USA, University of Colorado, Denver, Washington State University, USA and the University of Cambridge. I currently have an Associate Researcher appointment at the Smithsonian Institution, USA and am Adjunct Faculty at the National Institute of Advanced Studies, Bangalore, India and Adjunct Professor at Augustana College, Sioux Falls, SD, USA. I am a editorial board member of the journal Ethnoarchaeology. I have been active in a number of amateur archaeological societies (co-foundr of a Colorado Archaeological Society chapter) and was a member of the Colorado Historic Preservation Review Board (Govenor's appointment). I have been ivited to give research presentations at most UK university archaeological departments as well as throughout Europe, Central Asia, Siberia, North America and South America. As an exper flintknapper I have contributed to innovations in analytical methods and as an Anthropologist I am currently invistigating the application of the process of Revitalization Movements as a mechanism of culture change in pre-contact societies in North America. I have had a lot of media experience primarily participating in documentaries. Over the years this has included productions in many countries such as Japan, South Korea, South Africa, Germany, the US and the UK. My most recent appearances have been in BBC's The Incredible Human Journey with Prof. Alice Roberts (http://www.bbc.co.uk/programmes/b00kfqps)and Prehistoric Autopsy (Homo erectus) with Prof. Alice Roberts and Dr. George McGavin (http://www.bbc.co.uk/programmes/b01nlz8j). I also appeared, with Exeter students, in Channel 4's Secrets of Stonehenge (http://www.channel4.com/programmes/secrets-of-the-stonehenge-skeletons/episode-guide/series-1/episode-1). With the release of my recent book, Across Atlantic Ice, there was extensive international media coverage; some examples being: the Washington Post Feb 2012; Boston Globe 18 March 2012; New Scientist March 2013; Smithsonian Magazine Feb 2013; Muy Interesant (Spanish Language popular science magazine; amongst many others. My teaching efforts will be focused on involving students in fieldwork and doing short courses and workshops. I am Professor of Prehistory at the University of Exeter and have several international institutional affiliations including Research Associate at the Smithsonian Institution, adjunct Professor at Augustana College, Sioux Falls, SD and Adjunct faculty at the National Institute of Advanced Studies, Bangalore, India. I was raised in Michigan and was always fascinated by ‘Indian relics’ and spent as much time outdoors as possible. My summers were spent camping, canoeing, fishing etc. in northern Michigan and I was on track to pursue studies in herpetology. My family moved to outside Tucson, Arizona when I was in High School and the desert became my universe. This was where I first encountered ancient artefacts. I entered the University of Arizona and received a BA in anthropology with a minor in geology, but a passion for archaeology. Although I wanted to work in the Southwest (US) I had an opportunity to spend a summer digging in southwestern France, and my world changed again. I worked with renowned prehistorian François Bordes. Under his tutelage I gained proficiency in flintknapping, which opened up amazing opportunities and has influenced my archaeological career since. I received a PhD in archaeology from the University of Cambridge in experimental archaeology in 1977. Over the subsequent three decades I have been involved in research and excavations in England, France, Ireland, Spain, Lebanon, Kazakhstan, Russia and am now developing collaborative research in Brazil. I also worked extensively in Paleoindian sites in Arizona, Wyoming, Colorado and Texas. Even with all of this I have maintained my involvement in some of the leading archaeological research in the northern Southwest US that is redefining ancient Pueblo history. While many of my fellow University students went directly into academia, I spent much of my career working with and teaching interested members of the public, while undertaking research and maintaining ties with a number of Universities and museums.In 2003 I had the opportunity to join the University of Exeter Archaeology department and begin my formal academic career. This has been a great adventure and I can think of no other place I would rather be teaching. The Department of Archaeology is dynamic, friendly and very diverse with many international networks and enthusiastic students. We have great facilities and access to labs and outdoor spaces to conduct experiments. Having raised a family in rural western Colorado where any journey involved a car, my wife and I are enjoying residing near the centre of Exeter without a car. We love the community and the friendly nature of Devonians. I have concluded my research in Russia (although a new project may be on the horizon), Kazakhstan and France, while still maintaining contacts, and am focusing on the Ice Age colonization of North America, the Clovis Culture and Cultural Revitalization in the prehistoric northern US Southwest. As with most academic staff I have many roles along with research. I greatly enjoy teaching and interacting with students. Since starting in Exeter I have taken students on excavations in Russia, France, Ireland, Kazakhstan, South Dakota and Texas. I plan to continue to involve students in fieldwork and to encourage their direct participation in my research. Along with teaching and research, I have attend and presented at international conferences, acted as external examiner for universities in the US, UK and Sweden and fulfilled a number of administrative roles. I was director of the Centre for Archaeology of the Americas in the College of Humanities. I retired from the University of Exeter at the end of August 2017 and moved back to our family home outside of Cortez,Colorado.